Counterterrorist legislation is one of the main ways in which countries, particularly democracies, respond to terror attacks. Yet, there is to date no comprehensive cross-national database of counterterrorist legislation. This article introduces an overarching global counterterrorist legislation database (GCLD), covering more than 1,000 laws in 219 countries and territories over the years 1850-2009. I present the dilemmas and difficulties involved in constructing a global terrorism database and explain how these difficulties were addressed when assembling the current database. The article also brings descriptive statistics and analyses of the data, focusing on the historical development of global counterterrorist legislation and on the regional distribution of this legislation. It concludes with some recommendations for future researchers who may want to use the database. counterterrorist laws passed around the world following the terrorist attacks of September 11. But counterterrorist legislation, much like terrorism itself, is not a new phenomenon. As early as the 18th Century one may find (especially in the West) documented laws which may, by today’s standards, be referred to as counterterrorist legislation. While the term “terrorism” was absent from much of this early legislation, the measures and provisions that these laws entailed were largely directed at acts which today would be defined as terrorism. During the second half of the 20th century the term terrorism itself has increasingly appeared in state legislation, as governments became concerned with the threat that terrorist acts pose to their safety and internal stability. Even more importantly, the political advantages coming from declaring a law as a counterterrorist one (mainly in terms of domestic and international legitimacy) became increasingly clear. The attacks of September 11, 2001 mark a significant milestone in the global counterterrorist landscape, especially as it relates to counterterrorist legislation. Following the attacks, the United States began applying pressure on its allies to act against terrorist activities, largely through the use of new legislation or the amendment of former laws. In addition, three weeks after the attacks, on September 28, the United Nations Security council passed Resolution 1373, binding all UN member states. According to the resolution, member states should adopt various measures, including restrictions on the movement, organization and fund-raising activities of terrorist groups and individuals. In addition, it stipulated that countries should consider limitations on immigration and on refugees and share intelligence on terrorist groups and individuals. The resolution called member states to incorporate these measures into national laws by ratifying the international conventions on terrorism and ensuring the criminalization of terrorist offences in domestic laws. Finally, the resolution established the Security Council’s Counter Terrorism Committee (CTC) to monitor state compliance with these various provisions . Clearly, legislation is increasingly one of the main ways in which countries, particularly democracies, respond to domestic insurgency [6-8]. Yet, there is to date no comprehensive database that summarizes counterterrorist legislation worldwide and enables large-scale cross-national comparisons. This deficiency prevents researchers from more systematically exploring important issues such as the factors that bring countries to adopt such laws and the effects of counterterrorist legislation on subsequent levels of terrorism. 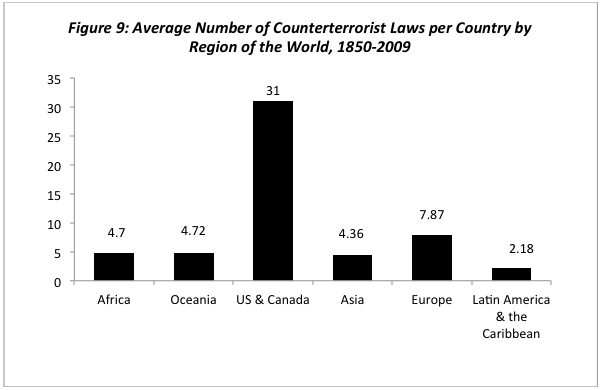 How prevalent have counterterrorist laws been in recent decades? Can one talk of ebbs and flows in national counterterrorist legislation throughout the 20th Century, or is there simply a trend of gradual increase in this type of legislation? Much has been written on counterterrorist legislation, especially in recent years, and some groups and organizations have collected information on counterterrorist legislation in particular countries and regions. However, there are large disparities in the way data are collected and in the definitions of the act, making it very hard to address important research questions. I introduce here a comprehensive global database, containing data on counterterrorist legislation in 219 countries and territories, and including over 1000 laws that were introduced between 1850 and 2009. I describe the dilemmas and difficulties in constructing a global terrorism database, including issues of standardized definitions and of data availability and reliability, and explain how I addressed these problems when assembling the current database. I also describe the coding and searching procedures I used during this process and present descriptive statistics of the data, focusing on the historical development of global counterterrorist legislation and on the regional distribution of this legislation. I conclude the article with some recommendations for future researchers who may wish to use the new database. One of the major debates among scholars of terrorism revolves around the definition of the term. Definitions for terrorism in the literature vary substantially, and there is no one unanimously accepted demarcation of the practice. While some emphasize elements of fear infliction [9-10], or the use of means that fall outside the routine forms of political struggle [6,11]], others believe that the central feature of terrorism is that it is directed towards civilians or noncombatants . My working definition here builds upon a growing consensus among social science scholars , e.g. [14,15-17] regarding the main characteristics of the phenomenon. Accordingly, I define oppositional terrorism as the strategic use of violence or threats of violence by non-state political actors against non-combatants for symbolic purposes, usually with the intention of influencing policies. This definition identifies that terrorism is directed first and foremost not at killing or terrorizing for the sake of it, but at influencing audiences and policies. Terrorism often targets a specific civilian population, and aims at diminishing its support for certain political policies. While defining terrorism is a hard task, finding a consensus over the definition of counterterrorism (and hence counterterrorist legislation) seems even harder. Ganor  for example, makes a compelling case for a specific and well determined definition of terrorism. However, when discussing the definition of counterterrorism he is much less decisive, stating simply that “(a)ny decision maker intending to formulate a counter-terrorism policy must first define the goal behind the war against terrorism” (p. 25). This tendency to leave the definition of the concept to policy makers is echoed by other scholars in the field [6,18,19-20]. Indeed, much of the academic literature on terrorism bypasses the question of how to define counterterrorism. Instead, it focuses on what states and governments actually do when faced with terrorist threats, acting under the, often implicit, assumption that this is counterterrorism. Following this line of scholarly work, and (as I explain later) in order to allow future researchers greater flexibility, I adopt here an inclusive definition of counterterrorism. For the purpose of this study, counterterrorism is defined as state policies, which are commonly enacted or implemented in response to oppositional terrorist events/threats, and/or policies declared by states as directed, at least partially, at preventing or limiting future oppositional terrorist acts. Despite the growing interest in terrorism and states’ responses to it, there is currently no global comprehensive database on counterterrorist legislation, one of the major measures taken by governments to try and deal with the problem. This deficiency is most likely the result of a few main factors, which include the difficulty of defining what counterterrorism is, the fact that data are hard to find, especially for developing countries, and the questionable reliability of many of the sources. The most obvious problem in constructing a cross-national database is that of finding a consensual definition for the practice. As noted above, scholars and policy makers find it hard to agree on the definition of counterterrorism, and this controversy also applies to counterterrorist legislation. More specifically, a few major points of contention arise when trying to construct a counterterrorist database. Five such points are briefly addressed below. First, while some may hold that counterterrorist legislation, as suggested in its name, necessarily comes as an active response to terrorist acts, others would include in it legislation that has the potential to prevent future acts. Thus, for example, most scholars consider the extensive legislation in Australia following September 11 as counterterrorist legislation, although most of it has been preventive rather than responsive. Second, some may argue that any counterterrorist legislation must include explicit reference to terrorist acts, while others would suggest that counterterrorist legislation also includes laws that apply to terrorist threats, even if these laws are directed more generally at criminal behaviors and other violent acts. An exemplary point of debate here would be criminal acts/codes, or penal codes, which in many countries (e.g. Brazil, Chile, Ethiopia, Ghana, Greece, Jordan, Poland, and Sweden) were not legislated with terror acts in mind, but nevertheless effectively served as the base for punitive and preventative measures in the fight against terrorism. A third point of contention arises over the portion of a particular law which should be explicitly devoted to counterterrorism. Should the entire law focus on terrorism to be considered eligible, such as in the case of the 2004 Australian Anti-terrorism Act? Or is it enough that a few sections or articles in the law are terrorism-focused, as is the case with the 1998 Bulgarian Law on Measures against Money Laundering? Furthermore, should one look only at laws that are explicitly declared as counterterrorist, such as the 2006 Law Number 2006-64 Relating to the Fight against Terrorism in Chile? Or should laws that effectively focus on fighting terrorism without adopting a formal definition (e.g. the US Patriot Act) also be considered? Fourth, one may question the eligibility of laws that attenuate previous legislation, make concessions to terrorists (for example in the form of structural, political or economic reforms), or focus on issues such as compensating the victims of terrorist acts rather than on the direct fight against terrorism. For example, the 2004 Prevention of Terrorism (Repeal) Ordinance in India largely served to reduce the severity of the repressive 2002 Prevention of Terrorist Activities Act (POTA). In Spain, Law Number 32/1999 on Solidarity with Victims of Terrorism focuses on the victims of terrorist acts and on the ways that the state is committed to them. Finally, there is the matter of legal procedures which are not formally defined as national laws. These include military and court decrees, special regulations and provisions, legislation passed on the local level (e.g. legislation passed by specific states in countries with a federal system, such as the United States and India), and amendments to previous laws. All these may be considered as part of a country’s counterterrorist legislation by some scholars, but not by others. The other major difficulty in constructing a global counterterrorist legislation database lies with the nature of the data on legislation at the national level. Sources that report on counterterrorism include online databases, edited scholarly volumes and academic publications, reports of national and international governments and agencies, and other non-scholarly reports, such as newspaper articles. These sources vary greatly in their definition of the practice, in the range of years they cover, and in the depth, consistency and reliability of their data. While some of them provide detailed information on laws and in some cases even links to the full legislation, other sources only mention the name of the law and contain no further information. In addition, there is considerable inconsistency in the quality of the information that can be obtained for various countries. While information on some countries, especially in the developed world, is exceptionally detailed and can be cross-checked by comparing various data sources, other countries received very little or virtually no scholarly and media attention, making it very hard to collect information on their legislative practices. In the next section I describe the strategy I adopted for dealing with the problems of definition and the quality of the data. The issues raised in the previous section are important and deserve both theoretical and empirical consideration. In particular, scholars who wish to study the causes and effects of counterterrorist legislation should give serious thought to the definition of the concept. However, when trying to assemble a global dataset, these difficulties can be paralyzing. In fact, in all likelihood this has been a major obstacle in the way of former research. The inability to reach a consensus over the definitions of terrorism and counterterrorism has prevented scholars from embarking on the task of assembling a comprehensive legislation database, in spite of the clear empirical and practical necessity of such an endeavor. When collecting the data for the present database I adopted a different approach. Rather than trying to define in advance what counterterrorism is (an attempt which is almost bound to prove futile), I used an inclusive definition, allowing future research endeavors to independently determine which laws should be included in or excluded from a given research. When constructing the database, I therefore collected data on each and every law that was reported as counterterrorism or anti-terrorism  by at least one of the sources I was able to track down in my searches, without trying to assess how well this law fits any predetermined definition of counterterrorist legislation. Thus, the final database includes laws which did not even mention terrorism or had only a few sentences addressing it, ones that decrease the severity of former legislation or talk about the compensation of victims, and amendments to former laws. This strategy allowed me to collect information on important laws that may have been excluded had constrictive predetermined definitions been used. However, it also led to a database which is arguably over-inclusive. Therefore, to allow future researchers the option of adopting their own definition and easily selecting only laws that conform to this definition, I added for each law in the database a series of dummy variables denoting whether it fulfils each of the following (non-exclusive) categories: 1) the law is a concession to terrorists or focuses on attenuating sanctions against terrorists; 2) the law focuses on compensation for the victims of terrorist attacks; 3) the law ratifies an international convention on the fight against terrorism; 4) the law renews or amends former legislation; 5) terrorism is mentioned in the official name of the law;  6) the law focuses on fighting terrorism; 7) the law includes at least one section, article or provision devoted to terrorism; and 8) the body of the law contains explicit use of the term “terrorism” (or any of its inflections). Despite my attempt to be as inclusive as possible, I did not collect data on military and court provisions or on special decrees and regulations. I recognize that some states may use these legal provisions as substitutes for legislation. However, data on these practices was particularly scarce and erratic, and was missing for the large majority of the countries. I therefore felt that it would not contribute to the final database, but rather could only serve as a source of confusion and may distort the findings. Since the dataset focuses on legislation at the national level, laws adopted by states included in a federal system (e.g. specific US states), as well as regional or global level laws (e.g. legislation adopted by the European Union) were excluded. High quality (3): At least two reliable sources (i.e. academic publications or well researched online datasets) regarding counterterrorist legislation in the country were available, allowing the validation and cross-checking of information. Moderate quality (2): At least one reliable source (an academic publication or a well researched online dataset) regarding counterterrorist legislation in the country was available. Low quality (1): No reliable sources could be located. All information on the country was obtained online, based on searches in Lexadin legislation database and in the Google search engine. Figure 1 presents the distribution of countries and territories in the database, by region of the world and the quality of information on each country. High or moderate quality of information was available for over two thirds of the countries or territories (59 countries had high quality of information and 88 had moderate quality). For 71 countries no reliable information could be obtained, with African countries being highly represented in this category (Information for about 50% of the countries in Africa was of low quality). Using this coding of quality allows potential future researchers to decide whether they wish to study only countries for which information is solid and full, or whether they also wish to look at the legislation in countries for which information is less full and credible. The database was assembled between June 2006 and December 2009, using four distinct stages of data search and extraction: (1) Searches in large online databases, (2) Searches in edited volumes and in other scholarly publications, (3) Search in the Lexadin Database, and (4) Searches Using Google and Google Scholar Search Engines. Additional details about the search process, including a more detailed timeline for each of the four stages and details on some of the major data sources that were utilized, may be found in the Appendix. The complete Global Counterterrorist Legislation Database (GCLD) includes information on 219 countries and territories, 192 of them are sovereign states, recognized by the United Nations. Over all, the database includes information on 1131 laws between the years 1898 and 2009 using the most inclusive definition of counterterrorist legislation (Since only one law was passed before 1850, I will henceforth discuss only the 1130 laws legislated post 1850). When excluding amendments, concessions, attenuating legislation, and legislation that is focused on compensation for victims, the number decreases to 808 laws. 419 of these laws include at least one article that focuses on terrorism, and 257 of them are entirely focused on fighting terrorism. Finally, 161 laws include the term terrorism in their title, suggesting that they are formally declared as counterterrorist legislation by the state (although not necessarily serving to counteract terrorism in practice). Each of the countries or territories in the database has information on anywhere between 0 (in 75 countries and territories) and 63 (in South Africa) laws during the years 1850-2009. Although the database goes as far as the 19th century for some countries, over 95% of the laws in it were legislated after the Second World War. 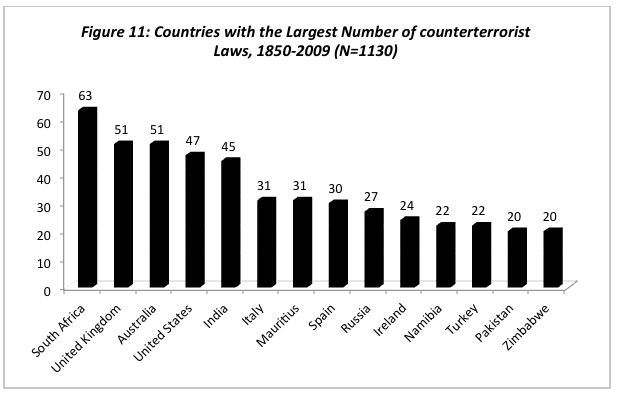 Below I present the historical trends in counterterrorist legislation since the end of WWII, followed by the regional and sub-regional distribution of this legislation. This section provides for the first time a comprehensive picture of the historical and regional trends in counterterrorist legislation and yields some interesting observations on the relationships between legislation and actual terrorist levels. In addition, the section serves to further reflect on the process of collecting the data and on the database’s validity and possible future uses. 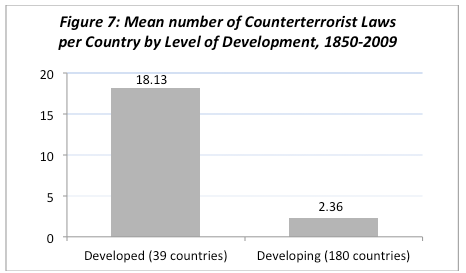 Figure 2 describes the evolution of global counterterrorist legislation since the Second World War (excluding the years 2008-2009, for which data is still very partial). As expected, it shows a gradual increase in legislation over the years, with a few peaks at the end of the 1970s, the beginning of the 1990s, and the end of the 1990s. The real peak comes however at the end of 2001 and in the subsequent year, following the terror attacks of September 11 and the UN Security Council Resolution 1373 of September 28, 2001, which called on all member states to adjust their national laws in order to ensure that terrorist acts are established as serious criminal offences in domestic laws. A very similar trend is revealed when narrowing the analysis to laws that focus more explicitly on counterterrorist measures. 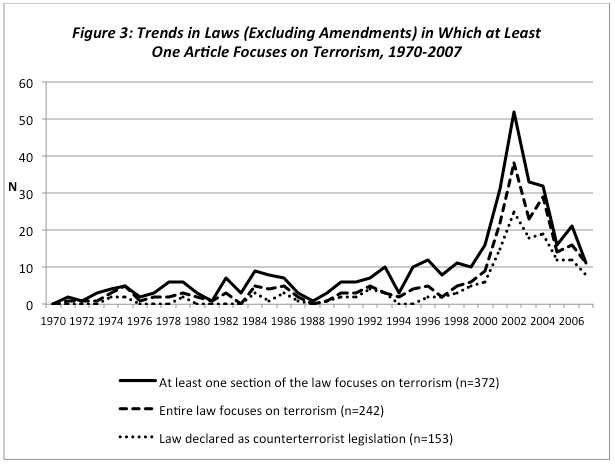 Figure 3 shows the historical development of laws in which at least one article or section is devoted to the fight against terrorism, starting in 1970 (before that year very few laws actually talked explicitly about terrorism). Again, we can observe a significant peak following the attacks of September 11 and UN Resolution 1373, regardless of the way one chooses to define what counterterrorist legislation is. III. Counterterrorist Legislation and Actual Terrorist Acts: Are They Correlated? This trend is especially interesting when compared to the trend in terrorist events during the same time period. 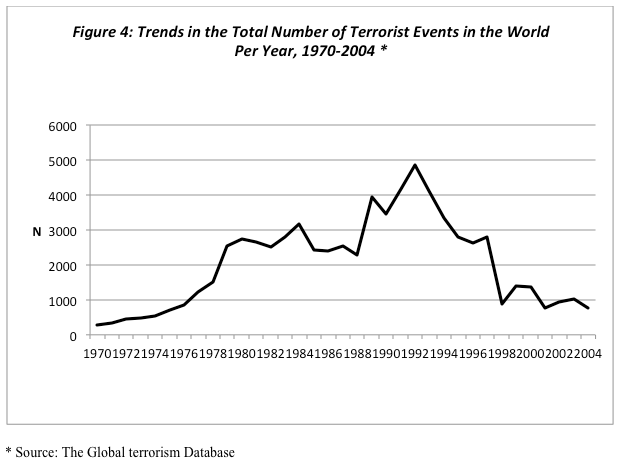 Figure 4 shows the annual number of terrorist events between the years 1970 and 2004 . Comparing the two figures reveals a discrepancy between the steady increase in global counterterrorist legislation over the years and the substantial decrease in the number of terrorist events worldwide after 1992. This trend shows that the decoupling of the two practices began even before the attacks of September 11, 2001. The discrepancy between Figure 3 and Figure 4 shows that counterterrorist legislation is frequently decoupled from actual terrorist threats. This suggests that other factors may be more central in inducing states to adopt counterterrorist legislation. One such factor may be the political discourse on terrorism. An increase in the discourse on terrorism in the international and domestic arenas (as reflected in the media discourse about terrorism) is likely to induce a growing perception of terrorism as an immediate threat, even when the actual frequency of the attacks did not increase. The data presented in Figure 5 supports this alternative explanation for legislation. I constructed this figure using an analysis of data from the Lydia System for News Analysis . 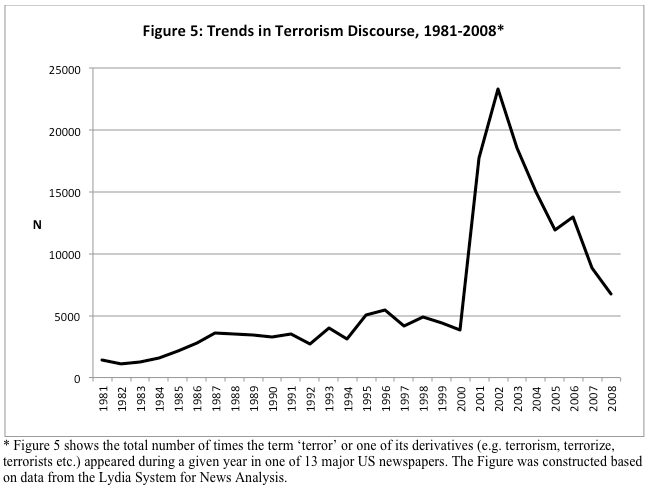 The Figure shows the yearly change in the US media discourse on terrorism between the years 1981 and 2008. It summarizes the number of times the term ‘terror’ or one of its derivatives (e.g. terrorism, terrorize, terrorists, etc.) appeared during a given year in one of 13 major US newspapers. Indeed, the trends in counterterrorist legislation (Figure 3) resemble much more the trends in terrorism discourse (Figure 5) than the trends in terrorist events (Figure 4) [27-28]. Examining the progression of counterterrorist legislation by the specific focus of the legislation adds further complexity to the picture. Figure 6 presents a timeline of three of the major types of counterterrorist legislation: financial legislation, legislation dealing with international cooperation and the regulation of immigration, and legislation that focuses on preventing terrorists from obtaining weapons (including biological, chemical, and nuclear weapons). 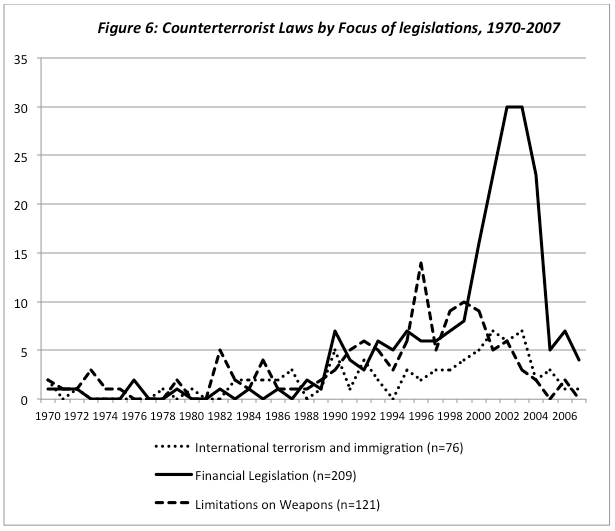 This figure shows that financial legislation increased dramatically since the beginning of the new millennium, and was clearly the main reason for the peak in the overall counterterrorist legislation described earlier. Legislation focusing on international terrorism and regulating immigration also increased somewhat during the first years of the 2000s, but not as dramatically. Legislation focusing on the limitation of weapons on the other hand reached its peak during the mid- and late-1990s, but decreased subsequently, and was not as influenced by the September 11 attacks (perhaps because these attacks demonstrated that one does not need sophisticated weapons to perform highly destructive terror acts). Figure 7 shows that developed countries had on average over 18 laws each, while countries in the developing world had on average only slightly more than 2 laws each. Two main reasons likely contribute to this pattern. First, developed countries are largely democracies, in which legislation is a major tool of legitimately fighting various security threats, including terrorism (see for example Wilkinson  and Alexander ). The second reason may be related to data availability. Developed countries are much more likely than countries in the developing world to keep records of their practices, and scholars, who mostly come from the developing world, are more likely to research and write on these countries. Therefore, the information in the database for countries in the developing world is likely less complete. Figure 8 presents the distribution of all laws by region of the world (according to the UN regional codes). Almost 80% of the laws were legislated in Europe, Asia and Africa. However, when looking at the average number of laws per country in the region (Figure 9), Northern America (i.e. the US and Canada) is clearly the region in which countries were most active, with Europe following behind. 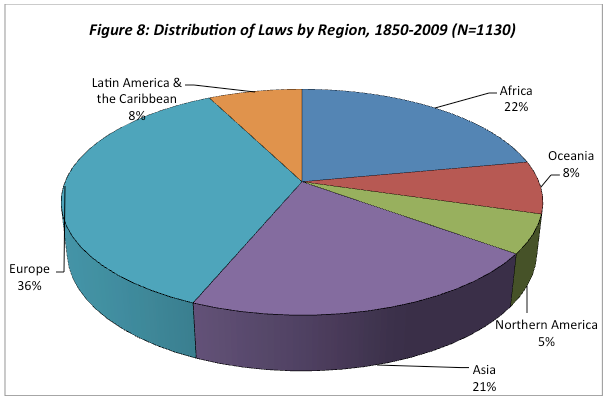 Figure 10 presents the distribution of laws by sub-region of the world (according to the UN regional codes), allowing for a finer look at the specific regions where legislation is most common. Three sub-regions stand out as having many more laws per country than the other regions: Australia and New Zealand (36 laws per country), Northern America (31 laws per country), and Southern Africa (25.4 laws per country). All other sub regions have less than 10 laws per country. While the first two regions include only 2 countries (Australia and New Zealand; the United States and Canada), Southern Africa includes 5 countries (Botswana, Lesotho, Namibia, South Africa, and Swaziland), which are not commonly considered part of the developed world and are not known to suffer from large ongoing terrorist campaigns. This finding is clearly affected by the fact that South Africa (the country) has the most laws of all countries in the database (63), as shown in Figure 11. However, Figure 10 also shows that other countries in Southern Africa had a large number of laws (including ones which are not included in the UN sub-region coding, but may geographically be considered as part of Southern Africa, such as Zimbabwe and Mauritius). One possible explanation for this pattern could be that countries in Southern Africa influenced each other and a process of spatial law diffusion occurred, in which legislation in one country facilitated legislation processes in its neighbors. While this is certainly a plausible explanation, I believe the answer to the puzzle also lies elsewhere, in the coding procedures. As explained above, to prevent the exclusion of important legislation, I coded a law into the database if at least one of the sources I searched defined it as a counterterrorist law. For Southern African countries, most information on legislation came from a single database: The Institute for Security Studies. While this source provides detailed and comprehensive data on legislation in Southern and Eastern Africa, it also adopted a broader definition of counterterrorism, reporting laws that may have not been considered as counterterrorist legislation by other sources. 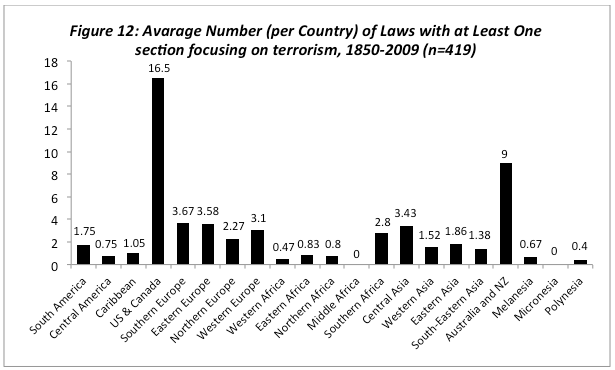 Indeed, when looking only at laws in which at least one section explicitly focuses on terrorism (Figure 12) one may notice that the average number of laws remained relatively high in Northern America and in Australia and New Zealand, but dropped dramatically in Southern Africa (to an average of 2.8 laws, almost one tenth the mean number of laws when legislation was defined more loosely). The case of Southern Africa highlights an important feature of the GCLD. It relies on multiple secondary sources, and therefore the data is highly sensitive to the quality of reporting in different sources and to the definition of counterterrorist legislation they adopt. For this reason, future researchers who may want to use this database should take extra caution when looking at and making inferences about the general body of laws (i.e. the most broadly defined set of laws). The case of Southern Africa suggests that scholars who choose to use the database may wish to limit their analyses to legislation that explicitly focuses on terrorism (or at least includes sections that explicitly focus on terrorism). Such narrowing down effectively entails some standardization across countries and data sources, and therefore may result in a more accurate analysis. Counterterrorist legislation is one of the major ways in which countries, democracies in particular, respond to terrorist threats. This article described the dilemmas and difficulties involved in assembling a global terrorism database and subsequently the processes of constructing such a database. The newly assembled GCLD is clearly the most comprehensive database in existence today, containing information on 1131 laws in virtually all countries of the world. As such, it has the potential to serve as an invaluable resource for scholars of terrorism and counterterrorism as well as for policy makers. The preliminary analysis presented here showed that global counterterrorist legislation has grown steadily since WWII, with a substantial peak following the terrorist attacks of September 11, 2001. 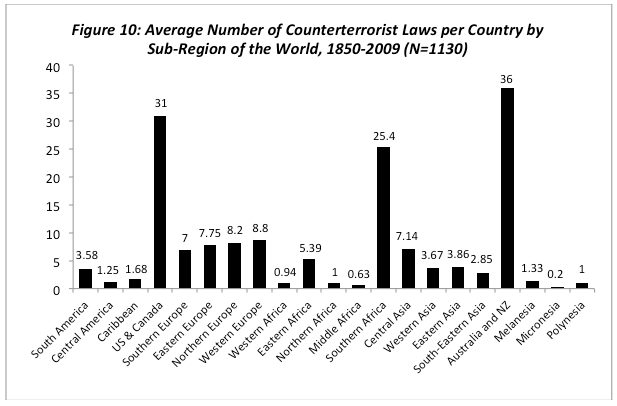 The analysis also showed that counterterrorist legislation is much more prevalent in the developed world than in developing countries, and is particularly common in North American and in Australia and New Zealand. Future scholars who choose to use the GCLD should take into consideration the way in which the data were assembled. Most notably, the collection process adopted an inclusive approach, making the final database more comprehensive, but probably not selective enough (as demonstrated by the case of Southern Africa). That said, the coding of the data allows potential future researchers to easily select sub-sets of it and examine them separately. Most notably, one can narrow the analysis by looking only at countries for which the data were more reliable or only at laws which focus more explicitly at fighting terrorism. The GCLD may serve to study many important questions related to counterterrorist legislation. Particularly, it may be used in conjunction with promising newly-released cross-national time-series databases looking at global terrorist practices (see most notably the Global Terrorism Database [27-28]. First, one may use the new database to examine the factors which induce states to adopt counterterrorist legislation. It is commonly believed that counterterrorist legislation is most often a rational state response to terror attacks. This logic suggests that higher levels of terrorism in a given country should induce more frequent counterterrorist legislation. Figures 3 and 4 presented earlier suggest that this may not be the case. While terrorist events reached a global peak during the early 1990s and decreased significantly since, the rates of counterterrorist legislation kept growing, especially following the attacks of September 11. 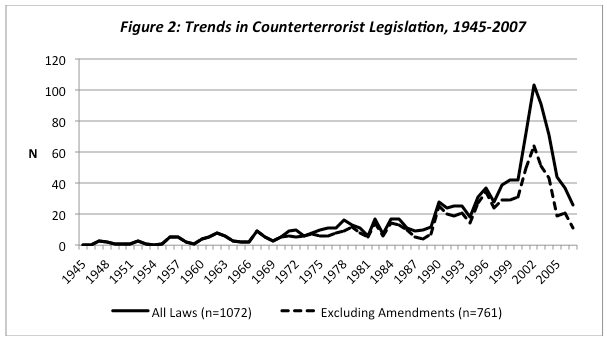 As shown in Figure 5, it is the discourse about terrorism (rather than the actual frequency of terrorist acts) that most closely correlates with counterterrorist legislation. A second promising venue for investigation based on this database is the study of the effects of counterterrorist legislation. Does counterterrorist legislation help in assuaging future terrorist levels, or does it only serve to further ignite the flame? Under which conditions and for which types of countries (e.g. democracies vs. more authoritative regimes) is counterterrorist legislation most effective? Are some types of legislation more influential than others? And how are other state-level practices and features are affected by counterterrorist legislation (e.g. commerce, military budgets, and respect for human and civil rights)? These questions are of great interest for scholars of law, conflict, and violence, but also for policy makers who wish to weigh the potential benefits of such laws against their potential disadvantages [4,30-31] . With the help of the new database, one can begin looking for answers to these questions on both the global and the national level. Searches in Large Online Databases. I. Legislationline (http://www.legislationline.org/). This database is operated by the Office for Democratic Institutions and Human Rights, an institution of the Organization for Security and Cooperation in Europe (OSCE). Created during the Cold War era, the OSCE is an ad hoc organization under the United Nations Charter. It includes 56 states from North America, Europe, Central Asia, and the Caucasus, and is concerned with early warning, conflict prevention, crisis management and post-conflict rehabilitation The database includes information on counterterrorist legislation and links to many of the laws in Europe and Central Asia (46 countries), and in North America, updated to 2009 . The website also includes links to reports on the counter-terrorist profiles of specific countries, prepared by the European Committee of Experts on Terrorism (CODEXTER), a committee formed in 2003 to coordinate the implementation of the Council of Europe's action against terrorism. II. South Asia Terrorism Portal (SATP) (http://www.satp.org/). Operated by the Institute for Conflict Management (a non-profit society, formed in 1997 and set up in New Delhi), SATP provides data on counterterrorist legislation in Bangladesh, Bhutan, India, Nepal, Pakistan and Sri Lanka, updated to 2009 . III. Privacy International (http://www.privacyinternational.org/). Privacy International (PI) is an independent non-profit human rights group formed in 1990. It defines itself as a watchdog on surveillance and privacy invasions by governments and corporations. The group is based in London, England, and has an office in Washington, D.C.; it includes privacy experts and human rights activists from forty different countries. The database provides information on counterterrorist measures in 18 countries, mostly in South America, updated to 2007 . IV. Interpol Bioterrorism Initiative (http://www.interpol.int/public/BioTerrorism/NationalLaws/default.asp). This website includes information on counterterrorist legislation in 55 countries from all regions of the world. It was collected by Barry Kellman of DePaul University and last updated in 2003 . V. Institute for Security Studies (http://www.issafrica.org/cdct/mainpages/leg_terrorism.htm). The Institution for Security Studies (ISI) is a non-profit trust, formed in 1991. The Institute is based in South Africa, but operates across Sub-Saharan Africa, with offices in Pretoria, Cape Town, Nairobi and Addis Ababa. This database contains information on legislation in 16 countries in Eastern and Southern Africa, updated to at least 2004 . The search in these online databases was conducted between June 2006 and October 2008. However, at the end of the entire search process, in December 2009, I went back to all five databases and updated the information again. In addition, I conducted searches for any scholarly publication reporting the measures taken by at least one country in its/their fight against terrorism. These publications were tracked using bibliographies of previously found sources and forward online searches in The Web of Knowledge database and in Google Scholar. This search yielded over 50 scholarly publications (mostly books and peer-reviewed articles) that included information on counterterrorist legislation in various countries (see Appendix 1 for a comprehensive list of these sources, as well as of the chapters from the edited volumes and of the websites from which data were extracted). Between October 2008 and February 2009 a general search was conducted in Lexadin legislation database , which includes information and links to over 50,000 laws of various types in 190 countries and territories. For each country I examined all laws appearing under the label “Criminal Law”. A law was then included in the database if the term “terror” (or one of its derivatives) was mentioned either in the name of the law or (when the full law was available online) in the body of the law. Finally, in the last stage of the search process (performed between January and December of 2009) I conducted a general search of all 219 countries and autonomous territories using Google’s search engine (both the Web and the Google Scholar search functions). The keywords used in this search were the country’s name, “law”, and “terror”. This search yielded a few dozen web pages that included reliable information on counterterrorist legislation in various countries. Richard Falk, (2007), 'Encroaching on the Rule of Law: Pst-9/11 Plicies within the United States', in Alison Brysk and Gershon Shafir, eds., National Insecurity and Human Rights: Democracies Debate Counterterrorism (Berkeley), pp. 14-36. Pavel K Baev, (2004), 'Instrumentalizing Counterterrorism for Regime Consolidation in Putin's Russia', Studies in Conflict and Terrorism, 27, pp. 337-52. Ian S. Lustick, (2006), Trapped in the War on Terror (Philadelphia, PA). Laura K. Donohue, (2008), The Cost of Counterterrorism (Stanford, CA). United Nations Security Council, (2001), 'Press Release: Security Council Unanimously Adopts Wide-Ranging Anti-Terrorism Resolusion'. Yonah Alexander, ed., (2002), Combating Terrorism: Strategies of Ten Countries (Ann Arbor, MI). Victor V. Ramraj, Michael Hor and Kent Roach, eds., (2005), Global Anti-Terrorism Law and Policy (Cambridge). Peter Chalk, (1996), 'West European Terrorism and Counter-Terrorism: The Evolving Dynamic', (New York). Austin T. Turk, (1982), 'Social Dynamics of Terrorism', Annals of the American Academy of Political and Social Science, 436, pp. 119-28. Bruce Hoffman, (1998), Inside Terrorism (New York). Charles Tilly, (2004), 'Terror, Terrorism, Terrorists', Sociological Theory, 22, pp. 5-13. Donald Black, (2004), 'The Geometry of Terrorism', Sociological Theory, 22, pp. 14-25. Jeff Goodwin, (2006), 'A Theory of Categorical Terrorism', Social Forces, 84 (2006), pp. 2027-46. Albert J. Bergesen and Omar Lizardo, (2004), 'International Terrorism and the World-System', Sociological Theory, 22, pp. 38-52. Boaz Ganor, (2005), The Counterterrorism Puzzle: A Guide to Decision Makers (Brunswick, NJ). Kristopher K. Robison, (2007), 'The Challenges of Political Terrorism: A Cross-National Analysis of the Downward Spiral of Terrorist Violence and Socio-Political Crisis' (Columbus). James A. Piazza, (2006), 'Rooted in Poverty? Terrorism, Poor Economic Development and Social Cleavages', Terrorism and Political Violence, 18, pp. 159-77. Christopher Hewitt, ed., (1984), The Effectiveness of Anti-Terrorist Policies (New York). Walter Enders and Todd Sandler, (1993), 'The Effectiveness of Antiterrorism Policies: A Vector-Autoregression-Intervention Analysis', The American Political Science Review, 87, pp. 829-44. Martha Crenshaw, (2001), 'Counterterrorism Policy and the Political Process', Studies in Conflict & Terrorism, 24, pp. 329-37. These two terms are often used interchangeably in the literature. Some scholars refer to more proactive and aggressive measures as anti-terrorism, while more reactive or passive responses are named counter-terrorism (e.g. Morris & Hoe 1987). However, the scholarly use of these two terms and the interpretation of what they mean are not consistent. I therefore refer here to all of these policies using the term counterterrorism, which is much more prevalent in recent years' literature. To name just one glaring example, if I were to define as counterterrorist legislation only laws in which terrorism explicitly appears in the name of the law, the US Patriot Act would not have been included in the database. This feature is especially important as it may help to determine whether the law was proclaimed by the state as focusing on countering terrorism. While this does not guarantee that the law indeed focuses on counterterrorist policies (a good example for that is the 1967 Terrorism Act in South Africa, which was primarily used as a tool for dealing with political opposition and adopted a very vague definition of terrorism), the declaration shows that the state believes, or at least wishes others to believe, that fighting terrorism stands in the focus of the legislation. This last feature (assigning a code for the focus of the law) was somewhat complicated, as some laws actually address a number of counterterrorist provisions all at once. In these cases, laws were denoted as “general” (about one third of the laws in the final database are therefore denoted “general”). The data used to create Figure 4 was taken from the Global Terrorism Database (GTD) 1 and 2, collected by The National Consortium for the Study of Terrorism and Responses to Terrorism (START) at the University of Maryland (LaFree and Dugan 2008a; 2008b)'. Levon Lloyd, (2005), Dimitrios Kechagias and Steven Skiena, 'Lydia: A System for Large-Scale News Analysis', in M. P. Consens and G. Navarro, eds., String Processing and Information Retrieval (Berlin/Heidelberg), pp. 161-6. Gary LaFree and Laura Dugan, (2008), 'Global Terrorism Database, 1970-1997 [Computer file]. ICPSR04586-v1', (College Park, MD). Gary LaFree and Laura Dugan, (2008), 'Global Terrorism Database, 1998-2004 [Computer file]. ICPSR04586-v2'. Paul Wilkinson, (2001), Terrorism Versus Democracy: The Liberal State Response (Portland, OR). Eran Shor, (2010), 'Terrorism and Human Rights in the New Millennium: In Search for Equilibrium', Qualitative Sociology, 33, pp. 205-210. Alison Brysk and Gershon Shafir, eds., (2007), National Insecurity and Human Rights: Democracies Debate Counterterrorism (Berkeley, CA). South Asia Terrorism Portal, (2009), 'South Asi Terrorism Portal'. Privacy International, (2008), 'Anti Terrorism Law and Policy'. Barry Kellman, (2003), 'National Laws and Measures: Counter-Terrorism Regulation of Biology'. Institute for Security Studies, (2009), 'Legislation -- Terrorism'. Juliet Lodge, ed., (1981), Terrorism: A Challenge to the State (New York). Alex P. Schmid and Ronald D. Crelinsten, eds., (1993), Western Responses to Terrorism (London). David A. Charters, ed., (1994), The Deadly Sin of Terrorism: It’s effect on Democracy and Civil Liberty in Six Countries (Westport, CT). Christian Walter, Silja Voneky, Volker Roben and Frank Schorkopf, (2004), Terrorism as a Challenge for National and International Law: Security versus Liberty? (New York). Lexadin, (2009), 'The World Law Guide'. Alexander, Yonah (Ed.). (2002). Combating Terrorism: Strategies of Ten Countries. Ann Arbor, MI: University of Michigan Press. Baev, Pavel K. (2004). Instrumentalizing Counterterrorism for Regime Consolidation in Putin's Russia. Studies in Conflict and Terrorism, 27, 337-352. Bergesen, Albert J., & Lizardo, Omar. (2004). International Terrorism and the World-System. Sociological Theory, 22, 38-52. Black, Donald. (2004). The Geometry of Terrorism. Sociological Theory, 22, 14-25. Brysk, Alison, & Shafir, Gershon (Eds.). (2007). National Insecurity and Human Rights: Democracies Debate Counterterrorism. Berkeley, CA: University of California Press. Chalk, Peter. (1996). West European Terrorism and Counter-Terrorism: The Evolving Dynamic. New York: St. Martin's Press. Charters, David A. (Ed.). (1994). The Deadly Sin of Terrorism: It’s effect on Democracy and Civil Liberty in Six Countries. Westport, CT: Greenwood Press. Crenshaw, Martha. (2001). Counterterrorism Policy and the Political Process. Studies in Conflict & Terrorism, 24, 329-337. Donohue, Laura K. (2008). The Cost of Counterterrorism. Stanford, CA: Stanford University Press. Dugan, Laura, LaFree, Gary, & Fogg, Heather. (2006). A First Look at Domestic and International Global Terrorism Events, 1970-1997. In Sharad Mehrotra, Daniel D. Zeng, Hsinchun Chen, Bhavani M. Thuraisingham & Fei-Yue Wang (Eds. ), Intelligence and Security Informatics, IEEE International Conference on Intelligence and Security Informatics, ISI 2006 San Diego, CA, USA May 2006 Proceedings (pp. 407-419). Berlin: Springer. Enders, Walter, & Sandler, Todd. (1993). The Effectiveness of Antiterrorism Policies: A Vector-Autoregression-Intervention Analysis. The American Political Science Review, 87, 829-844. Falk, Richard. (2007). Encroaching on the Rule of Law: Pst-9/11 Plicies within the United States. In Alison Brysk & Gershon Shafir (Eds. ), National Insecurity and Human Rights: Democracies Debate Counterterrorism (pp. 14-36). Berkeley: University of California Press. Ganor, Boaz. (2005). The Counterterrorism Puzzle: A Guide to Decision Makers. Brunswick, NJ: Transaction. Goodwin, Jeff. (2006). A Theory of Categorical Terrorism. Social Forces, 84(4), 2027-2046. Hewitt, Christopher (Ed.). (1984). The Effectiveness of Anti-Terrorist Policies. New York: University Press of America. Hoffman, Bruce. (1998). Inside Terrorism. New York: Columbia University Press. Lloyd, Levon, Kechagias, Dimitrios, & Skiena, Steven. (2005). Lydia: A System for Large-Scale News Analysis. In M. P. Consens & G. Navarro (Eds. ), String Processing and Information Retrieval (Vol. 3772, pp. 161-166). Berlin/Heidelberg: Springer. Lodge, Juliet (Ed.). (1981). Terrorism: A Challenge to the State. New York: St. Martin’s Press. Lustick, Ian S. (2006). Trapped in the War on Terror. Philadelphia: University of Pennsylvania Press. Piazza, James A. (2006). Rooted in Poverty? Terrorism, Poor Economic Development and Social Cleavages. Terrorism and Political Violence, 18, 159-177. Ramraj, Victor V., Hor, Michael, & Roach, Kent (Eds.). (2005). Global Anti-Terrorism Law and Policy. Cambridge: Cambridge University Press. Robison, Kristopher K. (2007). The Challenges of Political Terrorism: A Cross-National Analysis of the Downward Spiral of Terrorist Violence and Socio-Political Crisis. Ohio State University, Columbus. Schmid, Alex P., & Crelinsten, Ronald D. (Eds.). (1993). Western Responses to Terrorism. London: Frank Cass. Shor, Eran. (2010). Terrorism and Human Rights in the New Millennium: In Search for Equilibrium. Qualitative Sociology, 33, 205-210. Tilly, Charles. (2004). Terror, Terrorism, Terrorists. Sociological Theory, 22, 5-13. Turk, Austin T. (1982). Social Dynamics of Terrorism. Annals of the American Academy of Political and Social Science, 436, 119-128. Walter, Christian, Voneky, Silja, Roben, Volker, & Schorkopf, Frank. (2004). Terrorism as a Challenge for National and International Law: Security versus Liberty? New York: Springer. Wilkinson, Paul. (2001). Terrorism Versus Democracy: The Liberal State Response. Portland, OR: Frank Cass.